Peugeot and Citroen will sell versions of the Mitsubishi ASX, pictured. PSA/Peugeot-Citroen will sell two compact SUVs based on Mitsubishi Motors Corp.'s new ASX sport-utility. The tie-up will be the fourth industrial collaboration between the two automakers, adding to their existing deals on mid-sized SUVs, electric cars and a joint car factory in Russia. Beginning next year, Citroen and Peugeot will sell in Europe two still unnamed five-seat SUVs based on the Mitsubishi ASX, known as the RVR in Japan. Mitsubishi launched the RVR in Japan in February. ASX sales start in Europe this summer. PSA will launch versions of the ASX/RVR for the Peugeot and Citroen brands. The SUVs will share many components with the ASX but will have specific designs. For PSA, the new SUVs will expand the ranges of both Peugeot and Citroen and attract new customers in a market segment that is expected to grow worldwide by almost 60 percent by 2015, a joint PSA-Mitsubishi statement said. For Mitsubishi, the additional volume will enable it to increase production for the platform that underpins the ASX, allowing it to enjoy economies of scale. PSA plans combined annual sales of 50,000 units in western Europe for the Peugeot and Citroen variants. Mitsubishi plans 43,000 average annual sales of the ASX in its European markets, which include Russia and Ukraine. All three variants will be offered in Europe in front-wheel- or four-wheel-drive configurations. 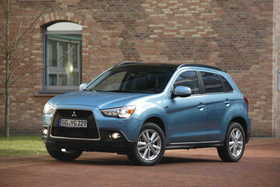 Mitsubishi will offer the ASX in Europe with a 1.6-liter gasoline engine and a 1.8-liter diesel. The Japanese automaker will supply PSA with a 2.0-liter gasoline engine for the SUVs, but PSA also will sell the vehicles with its own 1.6-liter diesel engine with CO2 emissions of 123 grams per kilometer and fuel consumption of less than 4.7 liters per 100km for the two-wheel drive versions. Mitsubishi's cleanest ASX is the 1.6-liter gasoline, emitting 135g/km. The compact SUV tie-up is the latest industrial collaboration between PSA and Mitsubishi. In 2007, PSA launched the Peugeot 4007 and Citroen C-Crosser mid-sized SUVs, which are based on the Mitsubishi Outlander. Last year, the C-Crosser edged the 4007 in European sales, 8,617 to 8,406, while Mitsubishi sold 19,228 Outlanders in Europe, according to UK-based market research JATO Dynamics. Last week PSA and Mitsubishi started production at a joint factory in Kaluga, 180km southwest of Moscow. Toward the end of the year, PSA will start sales of two electric cars, the Peugeot iOn and Citroen C-Zero, based on Mitsubishi's i-MiEV.